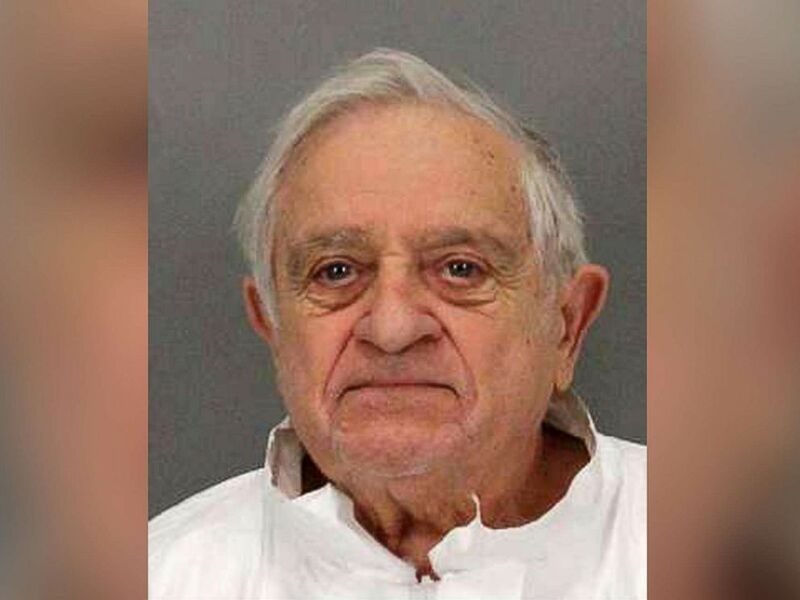 A 90-year-old man has been arrested for allegedly killing his stepdaughter after investigators gained information from the Fitbit she wore at the time of the incident, according to police. When authorities responded to a welfare check Sept. 13 at the San Jose home of 67-year-old Karen Navarra, they found her dead at the scene, the San Jose Police Department said. She had a gaping laceration on her neck, a deep laceration on her head and a kitchen knife in her hand, according to the statement of facts written by police and provided by the Santa Clara District Attorney's Office. A medical examiner determined Navarra couldn't have caused all the wounds herself and detectives believed the scene was staged to appear as a suicide, the document said. Police spoke to Navarra's stepfather, 90-year-old Anthony Aiello, who is married to Navarra's 92-year-old mother. Aiello told police he last saw Navarra Sept. 8 when he brought pizza and biscotti to her at home; Aiello said he stayed there for about 15 minutes then drove home, the document said. Anthony Aiello appears in this undated mugshot provided by the San Jose Police Department. Aiello told police when he was later outside his house, he heard a car honk and saw Navarra drive by waving with a second person in the passenger seat, the document said. Police recovered surveillance video from near Aiello's home and determined Navarra never drove by that day, the document said. Navarra had a Fitbit Alta HR on her left wrist when she was found, according to police. The data showed a significant spike in her heart rate Sept. 8 at 3:20 p.m., followed by a rapid slowing, the document said. The Fitbit stopped registering heart rate data that day at 3:28 p.m. He denied that he was present when she was killed and suggested that someone else might have been in the house. Police also checked surveillance video near Navarra's home and determined Aiello's car was parked in his stepdaughter's driveway from 3:12 p.m. to at least 3:33 p.m. on Sept. 8, the document said. Aiello, of San Jose, was arrested and charged with murder Sept. 25, police said. Aiello was read his Miranda rights and interviewed by police, during which he confirmed he was at his stepdaughter's home at about 3 p.m., the document said. Aiello told police he dropped off the pizza, didn't see anyone else in the home and left after five to seven minutes, the document said. Aiello said his stepdaughter walked him to the door and handed him two roses when he left, the document said. "During the interview, Aiello was confronted about the information from Fitbit and the corresponding surveillance video indicating that his car was in the driveway,” the document said. “After explaining the abilities of the Fitbit to record time, physical movement and heart rate data," investigators told Aiello his stepdaughter had died before he left. But Aiello "denied that he was present when she was killed and suggested that someone else might have been in the house," the document said. During the interview, investigators also told the 90-year-old man that police found two shirts with blood splatter in his garage; he responded that he cuts himself frequently, the document said. "He was told that the deposits of blood were not localized in one area and were more consistent with splatter," the document said. "Aiello indicated that he might have cut his hand and shaken it while he was wearing those shirts." Aiello appeared in court last Thursday before being remanded to custody, with no bail, authorities said, adding that he is scheduled to return to court this Thursday for plea proceedings and identification of counsel. A representative for Fitbit declined to comment to ABC News on the case. This isn't the first time a Fitbit was used as evidence to make a murder arrest. Richard Dabate is accused of killing his wife in Connecticut in 2015; a piece of evidence against Dabate is that the victim's Fitbit data contradicted what he told police, according to the Hartford Courant. He has pleaded not guilty and is awaiting trial. Also, when Iowa jogger Mollie Tibbetts vanished this summer, investigators said they were looking into what information could be gathered from her Fitbit. The data was not ultimately used in making an arrest in her killing.